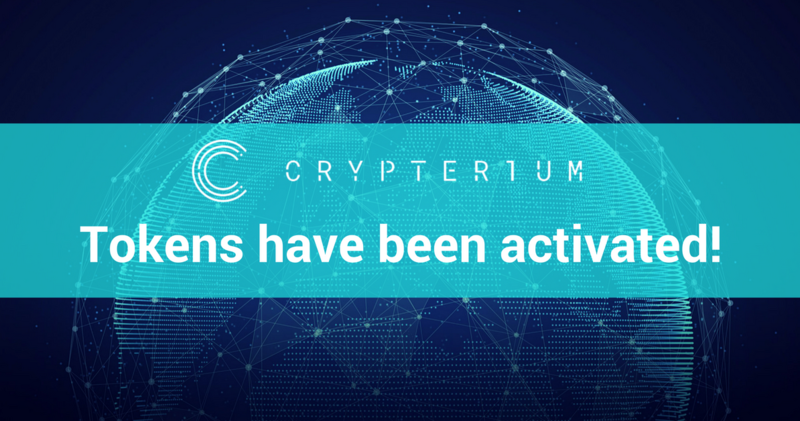 Today’s update from Crypterium’s team has some good news for you. Today, on January 20, 2018, we activate all CRPT tokens as per the legal terms specified in our public offer. What does that imply for our token holders? First and foremost, CRPT tokens can now be used to perform any actions specified by the smart contract: for instance, to be transferred to other ETH addresses. All current limitations will be lifted, and CRPT tokens will fully become their respective holders’ digital property. This will also lead to CRPT tokens being listed on token markets. This is a new milestone for our project! Our smart contract is programmed to detect token activation, meaning that the tokens cannot be deactivated at any point in the future. The activation is a one-time, irreversible procedure. Despite the activation, we will continue with token emission. The emission, however, cannot go on further than January 25; this is a technical limitation specified by our smart contract. Or you haven’t specified your Ethereum wallet address (in this case, please log into your account ASAP and enter your ETH wallet address; after that, the tokens will be sent out to you as soon as your turn comes). We’d like to remind you that token withdrawal is taking such a long time because of the limited bandwidth and general lack of stability within the Ethereum blockchain. Over the past 2 weeks, the blockchain has mostly been unavailable for transactions. We’ve recently posted a large article on that issue. Nevertheless, we’ve been working non-stop all this time. Sooner or later, each and every token holder will receive the tokens. Even if we don’t manage to deliver all the tokens via emission till January 25, we’ll release the remaining amount to our special transit address (the private key will be stored in Trezor). After that, we’ll continue to send tokens to token holders from that address via standard transfers (as opposed to emission). In order to boost the token withdrawal process, we’ve been working hard to implement batch transactions into our smart contract. Starting tomorrow, this solution will allow us to speed up the processing of our transactions within the Ethereum blockchain by several times. Separate transactions will be unified into batches; each batch will be processed and verified as a single transaction but will in fact contain multiple token withdrawal transactions. We’d like to thank our vast community for all the support and understanding! Aside from the blockchain-related technical issues, many technological peculiarities have been related to the huge scale of Crypterium’s token sale. In Crypterium’s case, the amount of tokens for withdrawal equals that for 15 regular ICOs. As always, feel free to contact us at support@crypterium.io if you have any questions.